Adidas and the Berlin public transport company created a buzz recently by releasing limited-edition sneakers with an integrated fare ticket. In addition to this quirky story, traditional e-ticketing is undergoing a major transformation that could ultimately make the validation and payment process completely transparent for passengers. Following are a few keys to understanding a fast-growing market, particularly since e-ticketing is a channel through which to access passengers and therefore their mobility data. After an initial digitization phase in the early 2000’s with the introduction of NFC-based cards such as Navigo and Oyster, e-ticketing has reached a new milestone by allowing public transport users to pay and validate simultaneously, for instance using their bank card as a ticket. 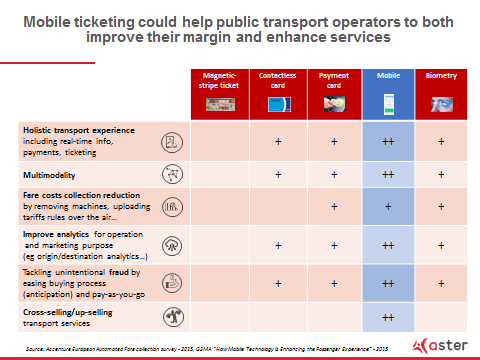 Operators see this as an opportunity to both reduce their collection costs (from 15% to 6% of the ticket price according to an Accenture study published in 2015) and improve the passenger experience by saving them a trip to the ticket machine. Although bank cards and even biometric technologies are sometimes tested, mobile devices are well-positioned to become the ideal integrated e-ticketing and payment system. They offer numerous advantages, such as engaging with the customer by becoming a conduit for real-time information or for sales of additional services. Traditional players are naturally taking numerous measures to adapt their product line. For instance, Siemens is promoting SiMobility JustGo based on Bluetooth Low Energy and beacons technology while moving forward with the acquisition of Hacon. The foursome created by Orange, Gemalto, SNCF and RATP are banking on NFC via their Wizway Solutions joint venture. For its part, Thalès’ e-ticketing division is still searching for its Prince Charming after the missed opportunity with Latour Capital in the spring of 2017. How to navigate this litany of technologies and which one to choose? A first market segmentation criterion is the presence or absence of gates in the public transport system. In fact, the presence of gates, a costly but important factor in the fight against fraud, hinders the use of some technologies: increasingly accurate geolocation algorithms (see MotionTag or GeoUniq) could, in theory, completely eliminate the validation process (Be In/Be Out). They are, for all practical purposes, unsuitable in about half of European cities that use gates in their subway system. In this market segment, the NFC protocol seems to be the popular choice, as evidenced by its recent adoption by New York City Transit. The second segmentation criterion pertains to the fluidity of the passenger experience. 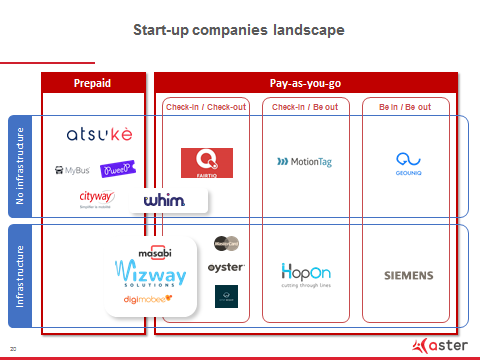 The concept of mobility-as-a-service is becoming more of a reality every day, for example in tests in the Paris region concerning short-distance carpooling. Karos informs us in its September 2017 deployment report that 20% of its court-voiturage® (short-carpooling) rides are intermodal. The ability to pay for one’s ride in multimodal route planners will therefore be the next step. E-ticketing therefore goes well beyond a quest for a marginal improvement in the profit margin of traditional operators. For them, it is about staying at the center of the choices made by the end customer, who has many options for getting from point A to point B. It is also about maintaining control of data, a firewall against the GAFA offensive, and the startups we met, which collect passenger data like cautious squirrels, fully understand this.